Lifestyle Living Room: What Do You Bring to the Table? Grab a plate, and take a seat in our Lifestyle Living Room as we talk about Thanksgiving tables and traditions. Brittney Lu: How do you celebrate Thanksgiving? Annika Olives: I usually don’t celebrate Thanksgiving; when we moved here from the Philippines, it was one of the traditions we didn’t pick up on because we don’t have a large family. Typically, Thanksgiving seems to be for larger families with the cranberry sauce and turkey, all of that. So before, we would go to a family friend’s house, but they lived far away, so after awhile, we stopped going. You? BL: We celebrated Thanksgiving pretty traditionally. I think it was my family’s attempt to help my brother, cousin, and me have an American tradition. Maybe if it was just my family without the second generation, they would not have celebrated it. AO: Why do think your family wanted to give you that American tradition? BL: Maybe it was their way of coming to terms with the idea that “we’re raising our family in America now, we should probably do American things.” Honestly, I’m not entirely sure, it always felt like we’re just there for family, not necessarily to celebrate a holiday. Do you ever feel like you “missed out” from a Thanksgiving? AO: Hmm, not really. It seems like Thanksgiving is always something you do with your family, and for me, the majority of my family isn’t here. I think it’s also the fact that I didn’t grow up celebrating Thanksgiving, so it was integrated into my life. It didn’t really make much sense to me to start it when I was already a grown kid. I don’t know. BL: Did your family do anything instead or was Thanksgiving just an extended weekend for you? AO: For me, Thanksgiving marks the beginning of Christmas, because that’s kind of what everyone else thinks too. But the day after Thanksgiving is the day we would go out and buy a live Christmas tree. Back in the Philippines, you just get these huge, fake trees, so coming here, it was our first opportunity to buy a real tree. And it meant a lot to my mom, with the smells and the tangible feeling of Christmas in our home. It marks a celebration of the holidays for my small family in America. Do you have any traditions? BL: I think as I grew up, the traditions I hold onto for Thanksgiving came — similarly to you — they came after Thanksgiving. What makes it Thanksgiving for me is the morning-after congee soup my grandma makes from the leftovers. To me, it’s pretty symbolic, like we’re going to celebrate, but we’re going to put our stamp on it. AO: Yeah, I kind of have a similar thing. My mom will actually make Chinese roasted chicken for Thanksgiving, and the day after, she will make a Filipino macaroni soup from the leftovers. I think that combining traditions and combining cultures is really special. I don’t think I’ll ever reach the extent of a traditional Thanksgiving, but I think if I incorporate my own culture into it, it makes it easier to celebrate. And I think that’s the gist of Thanksgiving — going back to where you came from and being grateful for those experiences. BL: I think I see that in how my dad will sometimes gather instead with some friends who are from China but live in Bakersfield. They don’t have a family to go home to here in America, so they’ll kind of create this hodge-podge family. Give me one word that would describe your Thanksgiving? AO: Comfortable. Even though there’s only three of us in my family, there’s never a time when we’re all together. Even when I was living at home, I would have soccer practice, my brother would have gymnastics, and my mom would be working, so Thanksgiving is a really nice time to slow down. Especially now, when I’m off at college, I don’t see them a lot, so it’s a nice five days to just relax and be with them. What about you? BL: Probably “gather.” We have family that comes from the North and the South of CA to my grandma’s house. Before I’d just be in Bakersfield, waiting for people to come, but now it’s also my turn to migrate. There’s this sense of being communal and family oriented and a reminder that we are part of a bigger community, even if it’s just family, which I am grateful for. AO: Do you have a favorite memory? BL: It’s not very thanksgiving related, but I remember the first time my aunts said, “You’re old enough to go black Friday shopping with us.” That was the best. I put granola bars in my little backpack and was ready for my turn to be apart of that “big kid” tradition. AO: Did you buy anything? BL: I bought a toaster, it was three dollars from target. AO: Three dollars?! How old were you? BL: Elementary school for sure. AO: And you bought a toaster?! BL: IT WAS THREE DOLLARS. My mom needed a toaster, since ours broke. So I got her a toaster for Christmas. But now I hate black Friday. It’s annoying, why go when you can sleep? AO: I went once when I was like, eleven, and I just remember sitting in a Macy’s with my brother, and we were both so exhausted, and my mom was just trying on shoes for hours. I feel like I went from not too old enough to too old. I feel like I never reached that point when I liked Black Friday shopping. BL: What’s your favorite memory? AO: Probably last year, when I surprised my mom and my brother. I wasn’t planning on going home, but I found a ride last minute. I drove all the way up to Manteca with my friend, and one of my other friends picked me up and drove me another hour home. And then I got flowers for my mom and then I rang the doorbell, and my mom and my brother were literally in PJs, they weren’t expecting me at all. And there’s this video of my mom screaming and my brother jumping into my arms and hugging me like a koala. Getting to surprise them was really special for me. BL: Let’s project into the future—whatever your family might look like at the time, if it’s kids or friends, do you feel like there is anything you would want to carry through from your family? Granted, traditions can be spontaneous or evolve. AO: I like the concept of coming together, like friendsgiving. Hardly ever do you get all your friends in one place, sitting together, eating food. 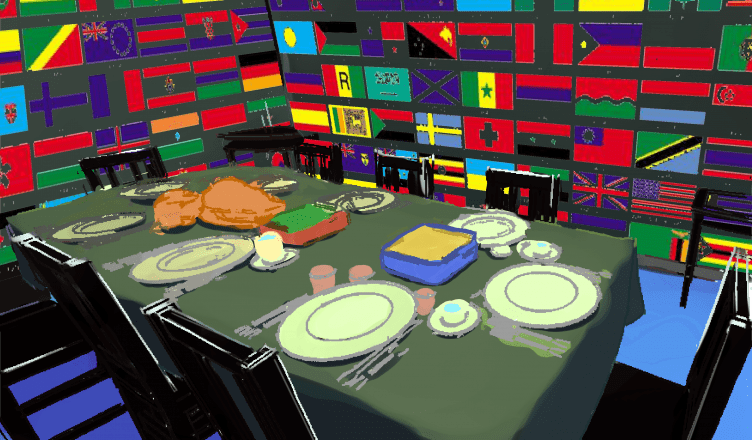 So I really like that, but I think when I have a family in the future, I’d want Thanksgiving to be a time when no matter when no matter where we are in the world, we always come back to one central place. I like the culture, the idea of everybody kind of bringing what kind of life experiences they’ve had into the mix. BL: I really appreciate the concept of friendsgiving. And I think especially now, in our more transient way of life and understanding of home, it’s nice to have that central core of people to come back to. Any last thoughts on Thanksgiving? AO: I feel like no matter how people celebrate Thanksgiving, the general idea is the same. And if you don’t celebrate it, that’s fine too. You shouldn’t feel like you have to celebrate it to be American or to be a part of this country. BL: I’d agree, it doesn’t matter how it’s celebrated. If it’s celebrated in a more “traditional” sort of way, that’s beautiful; but there is no shame in how you celebrate being grateful or gathering. We both celebrate differently, and how we do is affected by experiences, but there’s value in coming together and bringing those experiences with you. Celebrate it how you want.